Cynics in the local media like to say: there’s no such thing as the most absurd, only the more absurd. The Cantonese saying may not translate well, but the message is clear – just when we think we have seen everything, something more bizarre will come along to knock us off our feet. That about sums up this past week in Hong Kong, where a spate of mind-boggling events in local politics left citizens jaw-dropped and thinking only one thought: are these people for real? Several days ago, a woman was convicted of attacking a police inspector with, of all things, her breast. No, this is not one of those “his face ran into my fist!” excuses we used to hear in second grade – it is an actual ruling by a local magistrate. 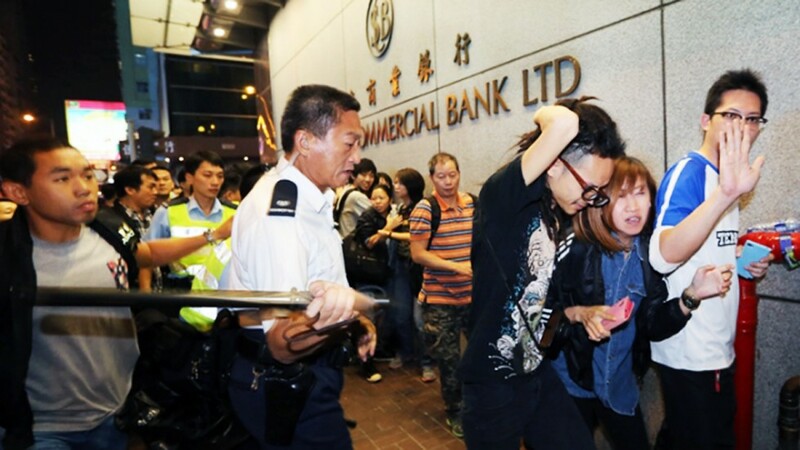 The 30-year-old defendant was found guilty of hitting the officer’s right arm with her bosom during an anti-parallel trade protest in March. It is unclear what kind of injuries the victim had sustained – no medical expert witness was called to testify. In a separate incident which also involves a police officer, superintendent Franklin Chu was accused of using excessive force, after being caught on video whacking innocent onlookers with his baton during a protest last fall. In an investigative hearing, the now retired officer explained that the baton was a mere “extension of [his] arm,” with which he had “patted” passersby to speed up pedestrian traffic. The defense was so creative, and the argument so cutting-edge, that it would make Johnnie Cochrane smile in his grave. Just when citizens were wondering whether they had been reading the April Fool’s Day edition of The Onion, they were bombarded with still more head-scratching and hair-raising headlines: Watergate, Laundrygate and Livergate. 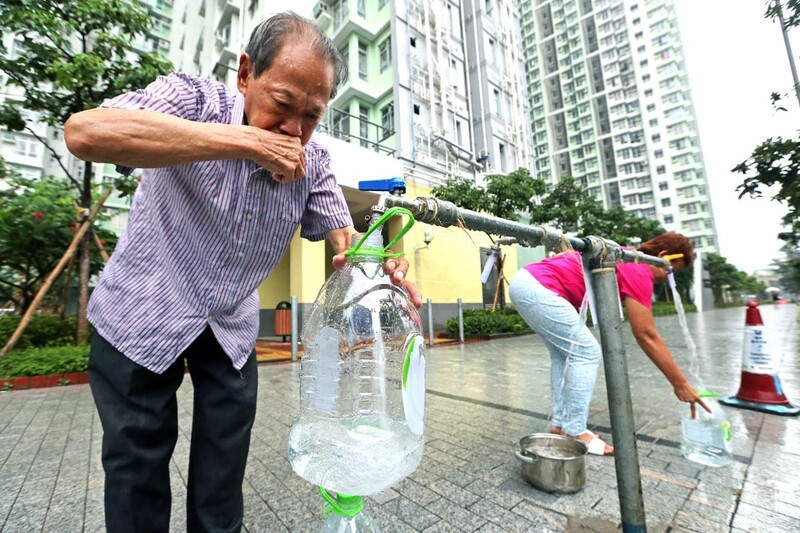 The first refers to the lead-contaminated water supply at a long and growing list of public housing estates, whereas the other two relate to medical blunders at public hospitals involving moldy bed sheets and miscalibrated machines to diagnose liver disease. Watergate is the most stunning scandal of the three, not only because of the large number of public housing residents it affects, but also the spectacularly blatant attempts by the government to downplay the incident. One official told reporters, with a straight face, that the lead intake is rather safe “if the amount is averaged out over the resident’s lifetime,” while Housing Secretary Anthony Cheung threw a local subcontractor under the bus and pinned the entire blame of the public health crisis on one scapegoat. Meanwhile, the Health Department was under fire for underreporting lead levels – many water samples were collected after the faucet had been running for a few minutes, which allowed the level of contaminants to drop significantly from the actual levels to which residents have been exposed for many years. Citizens had barely the time to process these surreal events when our chief executive decided to drop yet another bombshell at a hastily called press conference Monday afternoon. Addressing shellshocked reporters all by himself (which in itself was unusual), C.Y. 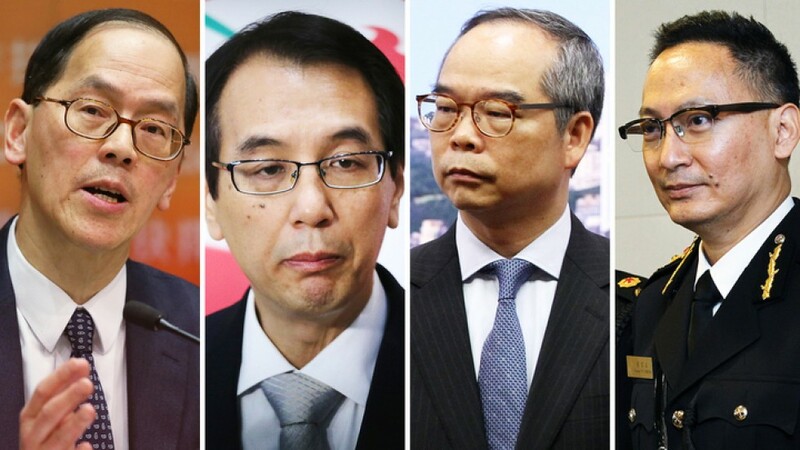 Leung announced that Tsang Tak-sing, longtime bureaucrat and brother of Legco chairman Tsang Yuk-sing, would step down as Secretary for Home Affairs, and that the position would be filled by Lau Kong-wah, former vice chairman of the pro-Beijing DAB party. Also fired – I mean retiring – was Civil Service Secretary Paul Tang, who would be replaced by Customs Commissioner Clement Cheung, a political unknown. The sudden cabinet reshuffle is astonishing for two reasons. First, both departures have added to the massive hemorrhage of personnel at the top level of government since C.Y. Leung took office in 2012. 11 other high ranking officials have either resigned or forced to leave in the past three years. The revolving door that is Leung’s cabinet speaks volumes about the boss’s people skills and ability to lead. Second, the appointment of Lau Kong-wah as Home Affairs Secretary flies in the face of meritocracy and reflects Leung’s “bite me” attitude toward critics. Lau is a washed-up politician so reviled that netizens compare him to a public trash can. His failure to keep his Legco seat in the 2012 elections drew revelers to celebrate outside his councilman’s office. Lau's surprise promotion this week, which will nearly triple his current salary as Mainland Affairs Undersecretary, feels like a practical joke for Leung to spite opponents. Anywhere else in the world, any one of the foregoing events would have caused a public uproar. Having all of them happen in the same week would have sent angry mobs to the streets – vehicles would have been set on fire and government buildings stormed. Lawmakers would have initiated a vote of no confidence to remove the political leader. Not so in Hong Kong. After the initial shock has passed, the news cycle hurtles on. Each headline elicits a dry laugh from citizens and makes them pause for a moment, before everyone returns to whatever it is that they busy themselves with. Hong Kongers now have the memory of a goldfish and the attention span of a hyperactive toddler. To get a sense of this collective ADHD, look no further than what has been trending on social media these past few days. Two pieces of entertainment news received wall-to-wall coverage on Facebook, and completely eclipsed political issues of far greater importance. 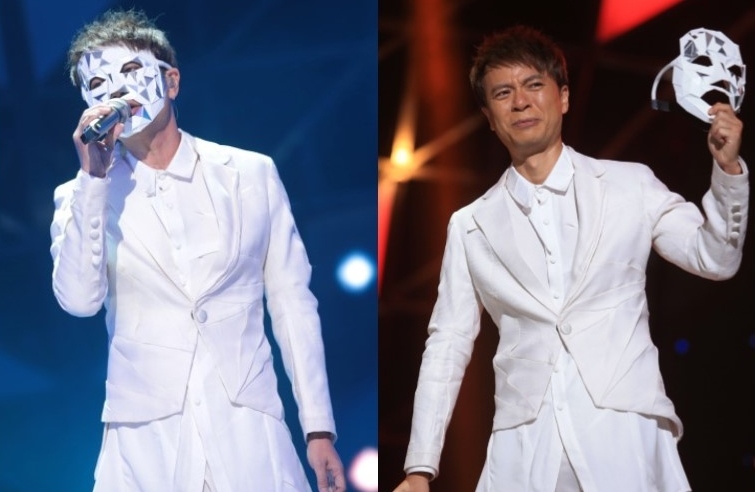 The first relates to Canto-pop singer Hacken Lee, who has won some singing contest in China wearing a mask on stage to conceal this celebrity identity. Whoopie doo. Then another pop singer Juno Mak posted a trilogy of gut-wrenching ballads with which love sick listeners seem to resonate. Whoopie whoopie doo. Suddenly, all that outrage about police brutality, lead poisoning and Mr. Trash Can vanished from the public consciousness. Anger and indignation are switched off and replaced by a whole different set of emotions. But Hacken and Juno shouldn’t celebrate too quickly either – the moment the next cat video or grumpy baby meme comes along, they too will suffer the same fate and disappear into the echo chamber of the Internet. The phenomenon is hardly limited to the general public – even the victims in some of the news stories are having a hard time staying focused. Take the Watergate scandal as an example. Tens of thousands of public housing residents have been exposed to lead for years, which may have caused kidney failure, heart disease, reproductive problems, and for babies and young children, brain damage. So far, at least 39 residents were found to have excessive lead in their blood, of whom 27 are children under six and the remaining 12 are lactating mothers. Does it mean riots at the housing estates or heads rolling at the Housing Department? Not quite. As soon as the government brought in free bottled water and free water filters, and promised to replace faucets and pipes in the coming months, the complaints subsided. Lead-poisoned residents happily accepted the government’s band-aid solutions, never mind the long term health effects or holding the negligent parties responsible. Allegations that a Chinese state-owned construction company had supplied substandard faucets swirled around for a while and faded away. Like everything else, the issue flamed out after the news cycle passed. Hong Kong is suffering from a bad case of ridiculitis. Each government action or inaction gets more absurd than the last. But instead of demanding answers and accountability, citizens are more blasé and easily distracted than ever. Their attention span may have gotten shorter still after the Umbrella Movement ended last winter. Since then, many have been mired in hopelessness and detachment. 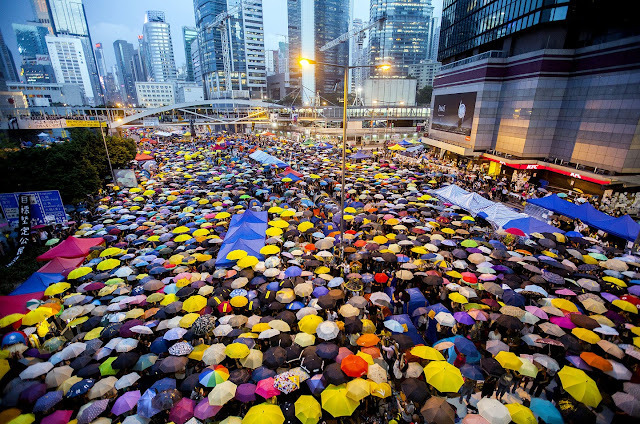 Hong Kongers can’t help but feel that nothing they say or do – even after taking the drastic step of staging a massive protest that paralyzed large swaths of the city for 79 days – is able to change a thing. Their government and, to a larger extent, Beijing, are like a brick wall, immovable and impervious to any amount of kicking and screaming. In other words, their cynicism is merely a coping mechanism. For if they take things too seriously and fight too tenaciously, they will wind up hurting and disappointing themselves. If this didn't work, what will? So we end up right where authorities want us to be: in a state of willing submission where “oh well” is the response to every policy and decision, no matter how shocking or absurd. Nevertheless, if we genuinely care about our city and don’t want to be the docile subjects we are gradually becoming, then we had better start paying attention to things that actually matter, and keep our eyes on the ball until common sense is restored. Everything else, like Hacken and Juno, is just social anesthesia. 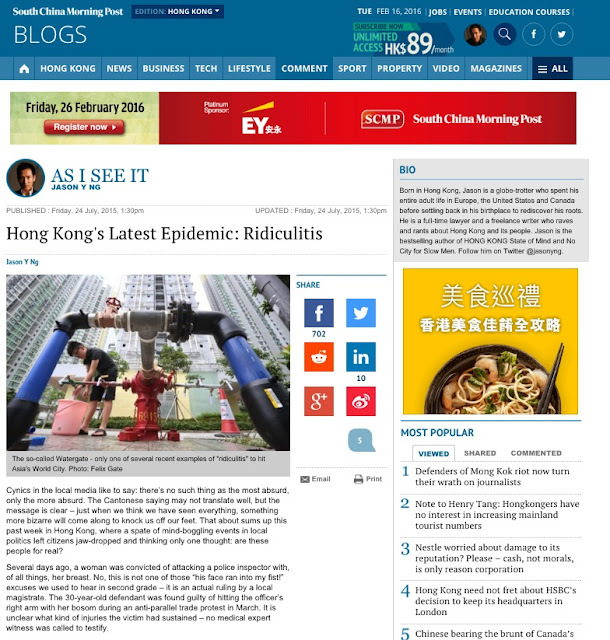 This article was published in the South China Morning Post under the title "Hong Kong's latest epidemic: Ridiculitis."